When I was a youngster, my mom and I would wake up early every Sunday morning to clean the house. Now I know most kids would rather sleep in on a Sunday morning, but I always enjoyed these mornings that I spent hanging out with my mom - not only was it great bonding time for us, but we were also rewarded with a spotlessly clean living environment! Luckily, I was introduced to Seventh Generation, an environmentally friendly line of cleaning and household products. Seventh Generation has recently tapped into the disinfecting power of the herb thyme to introduce a line of disinfecting sprays and wipes that kill germs naturally! The new line of botanical disinfectant cleaners includes a multi-surface cleaning spray, bathroom cleaning spray and wipes. I took a test run of these cleaners and - well - you can see the fabulous result above! So a non-toxic cleaner that actually works - I guess I get to have my cake and eat it too - and on a nice clean countertop to boot! "Mine is dirty clothes dropped right next to the laundry basket, agh!" 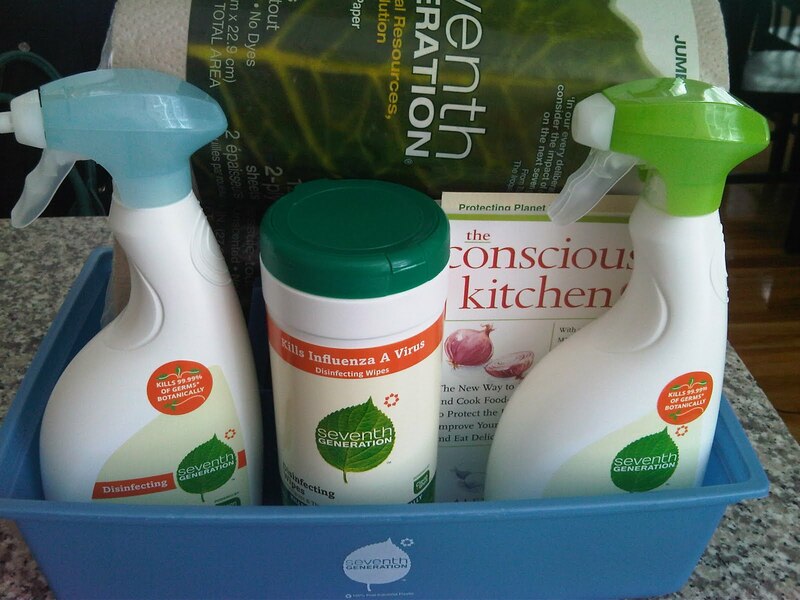 Seventh Generation (via myblogspark) wants to give one financefoodie.com reader a Seventh Generation “Disinfecting Cleaning Kit” that includes a disinfecting multi-surface cleaner, bathroom cleaner, wipes, a copy of eco-lifestyle consultant and author Alexandra Zissu's book The Conscious Kitchen, a cleaning caddy made from recycled plastic, and two rolls of 100% recycled, unbleached paper towels. Contest ended Friday April 9 at 5pm EST. Winners will be chosen via random integer generator on random.org announced on the financefoodie.com site shortly afterwards that night! Soap scrum in the bathtub. I cant stand that. I have to clean it right away. Dirty shoes on carpet! right after I cleaned them too! My pet peeve is dragging around a heavy vacuum cleaner, up and down the stairs!! Fingerprints all over the Stainless Steel appliances. Use the freaking handles! Dirty walls totally freak me out! I hate clutter. It is a pain to try to keep it in check. My pet peeve is dirty light switches. I CAN'T (sorry for screaming) STAND when someone makes something (sandwhich, toast, anything) and leaves crumbs on the counter and bits of jam, butter or whatever! ahhh it drives me batty! I have many pet peeves, but one of them is misspellings (not typos) :) *Thanks* for the giveaway! My current pet peeve is socks that go thru the laundry without their mates. Where do all the missing socks go? I can not stand finger prints all over my walls and interior doors! My pet peeve is toothpaste worms in the sink! My pet peeve is not cleaning up after oneself in the kitchen! Thanks! Leaving dirty dishes in the sink without rinsing them. Mine is dirty clothes dropped right next to the laundry basket, agh! Thanks for the great giveaway! My pet peeve is dust! My furniture is dark and every speck shows up... what a pain! kitties who like to track cat litter out of the litterbox YUCK! My worst pet peeve is people who are rude. My pet peeve is that right after I clean something, one of the kids or my dh will turn it into a mess. Ugh! I'd have to say my biggest pet peeve is when people in my house leave food on the counter when they aren't using it. My pet peeve is dirty dishes in the sink. Thansk. Clutter on my kitchen counters! Every time my husband is in there, he leaves stuff out on the counters and I have to go put it away. My pet peeve is people who don't use their turn signal! Not replacing the used up toilet paper roll with a fresh one...I mean how hard is that right?? Toilet paper rolls not being replaced! I hate crumbs on the counters. I get ticked when others knowingly spill or otherwise make a mess and walk off, with the attitude the fairy maid will take care of it. A dirty kitchen sink! Can't stand it! My pet peeve is dirty dishes in the sink! Either put them in the dishwasher or wash them by hand! I hate clutter. Whenever I go to my inlaws, you cannot even work on the counters in the kitchen because they are filled with junk. I hate dirty dishes in the sink. I can't eat in a house that has a dirty kitchen floor or countertops. My pet peeve is kids not taking care of there dishes when there done eating. Crumbs on the linoleum and mud/dirt marks on the carpet from dirty shoes. I don't like dirty countertops. Hair --with 3 teens and all kinds of pets I feel like I spend my life cleaning up hair! it's everywhere!! Does it have to be about cleaning? If so, it would be finishing one room going to another then coming back to find first destroyed (yeah, love kids & dogs- just not the messes). I hate it when someone vacuums or sweeps and doesn't move anything. There is still dirt surrounding everything. Wires!! I cant stand to see Wires! A company, or Workman that dont do the job right and you have to keep calling them back to fix what they didnt know what they were doing in the first place. I hate a dirty kitchen floor. Following Finance Foodie on Twitter (@Hotsnotty2) Thanks! My pet peeve is people who don't clean up after their pets. Honestly, there is nothing quite as bad as walking into a home with a reeking litter box - ugh! One pet peeve is "sprinkles" on the toilet seat, the floor, etc. Mail stuffed back into the envelope it came in. Why do people want to keep a ripped open mess like that? You don't need it anymore. Throw the thing away. My pet peeve is a sink full of dirty dishes. Thanks. My pet peeve are dirty toilets! Yuk! My roommate leaving a mess everywhere he goes! I had tracked in dirt. My pet peeve: bathrooms that are not clean and tidy! My pet peeve is when people don't put stuff away where it BELONGS! Cuz it takes 2 whole seconds out of your life to put it away, right? My pet peeve is putting a dish in the sink that could be quickly rinsed off and be fine. I mean, if you just heated water in a cup in the microwave, it's not even dirty! My pet peeve is not having a picked up and organized house! My pet peeve is walking in the house with shoes on. One of my pet peeves is not cleaning out the sink and drain after the dishes are done! Also a rolled up in a ball looking dish cloth..ugghh! Not washing out the sink after brushing your teeth and leaving toothpaste stuck to it! my pet peeve is a dirty stove/sink! My pet peeve is mold that seems to come back in my shower. Got to replace that fan!! Toothpaste (out of the tube) on the counter or in the sink drives me crazy. My pet peeve my dog who sometimes still pees on my carpet. 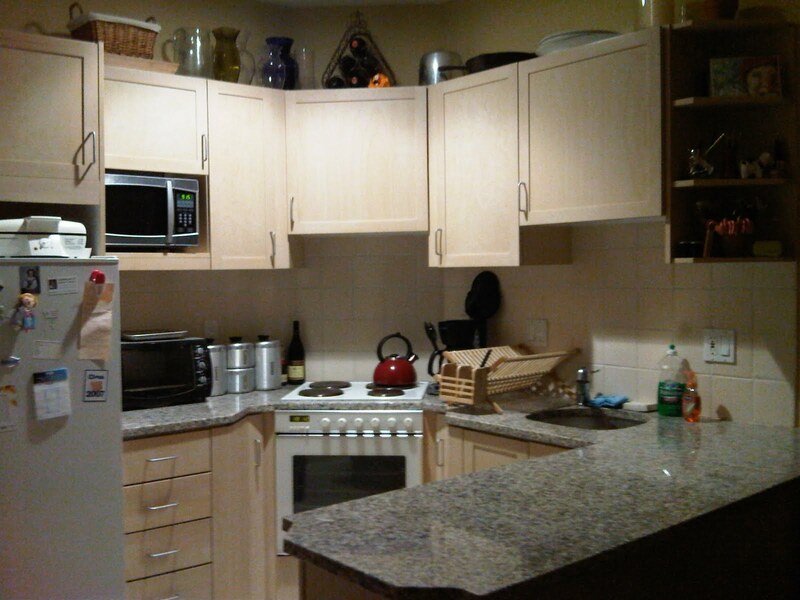 little splashes of coffee and sugar granules on the countertops - even worse, add some dry coffee grounds! Pieces of crap my dog brings in in his feet. He has even gotten goat poo in his feet and brought that in-we have goats. Sticks, stickers and stuff I don't even know what it is! Can be downright gross! My biggest pet peeve is when things aren't replaced such as an empty soap dispenser or toilet paper dispenser. Or the tissue box goes missing - ugh! One of my pet peeves is putting dirty dishes in both sides of the sink, I can cope with one, but when both have dirty dishes in them it makes me crazy. My pet peeve is people who drive slow in the fast lane.